Discover what the average tuition charge is for U.S. colleges, and how BRCN compares. See how fees and tuition at Blessing Rieman College of Nursing and Health Sciences compare to other U.S. colleges and universities and discover how you can effectively prepare for possible college tuition increases. How Does Blessing Rieman College of Nursing and Health Sciences Compare to Other Schools? The subsequent table outlines how BRCN measures up to other schools nationally, regionally and by state. How Much Will Tuition & Fees Be for BRCN? In the 2017 - 2018 academic year, full time undergrads at BRCN were billed $24,800, before modifications for financial need. From this total, the cost of tuition was $24,050. The other $750 represents additional fees. Unlike public colleges, BRCN does not provide a tuition discount to in-state students. Tuition and fees cover the costs of attendance for one academic year, but don't cover room and board, which will be an additional cost you will get if you live on campus. Then again, many students end up spending under full tuition after getting financial aid along with other rate reductions. See BRCN cost per credit hour here. 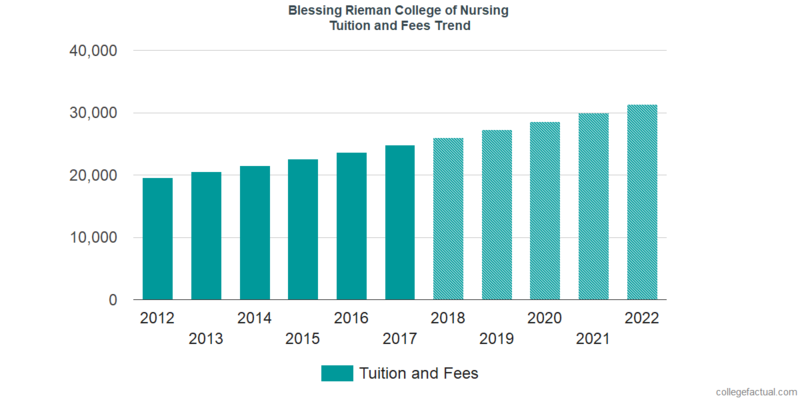 There has been an increase of 4.8% in Blessing Rieman College of Nursing and Health Sciences tuition and fees for out-of-state students in the past 5 years. Tuition expanded by 5.0% and fees expanded by 0.0%. This year, undergraduates should expect to pay $25,995 if the growth keeps up. Because of price increases, the full cost of a four-year BRCN degree will be $111,744, and the full expense of a two-year degree would be $53,244, which doesn't include additional expenses for books, transportation, and room and board. View what upcoming tuition and fees will be for BRCN students in the following chart. Because of inflation along with other factors, the price of college tends to grow every year. For this reason your final year of college could be much more expensive than your initial year.